Unfortunately, divorce is a fact of life. The statistics are that nearly half of all first marriages end in divorce, and the rates of divorce for second and third marriages are even higher! And while we may hope these numbers are wrong, the undeniable truth is there’s plenty of divorce going on. We all know someone who is thinking about separating or going through a divorce or who is already divorced. What I’m finding in my practice, mostly because of the current economy, is that people are looking for the least expensive way to settle their issues and to reach a final divorce. They may have lost their jobs or been downsized. Many have little or no equity in their homes now, and the amount of credit card debt is staggering. So how can you divorce without breaking the bank, cashing in your 401(k), or spending your children’s education fund? Stay out of court. Going to court is the sure-fire #1 way to spend any money you and your spouse do have. It’s a very expensive proposition, and a lot like flushing your money down the toilet. It’s a total waste of your assets at a time when you and your family need them. Do everything in your power to keep yourself out of the courtroom and to keep as much of your money in your pocket as you can. Agree on as much as possible on your own. If you and your spouse can agree on everything, one of you can go to a lawyer and have a property settlement agreement prepared, usually for a fixed fee, and then your spouse can take the agreement to another lawyer just to review. This is called “unbundling.” You are hiring the lawyer just for a specific task and paying either a flat fee or buying one hour of his or her time to review a document for you. Once you have an agreement, you can either finalize the divorce yourself or hire a lawyer. Most lawyers charge a flat-fee for an uncontested divorce, which is what you have if you and your spouse have signed an agreement. Hire a mediator or collaborative lawyer to help you resolve any issues you are unable to agree on. Either of these processes will keep you out of court and help you reach a settlement on all issues. A key point here is to “pick your battles.” Neither you nor your spouse will likely get everything you each want, but if you reach an agreement that is acceptable to both of you, then that is a good agreement. And it will be an agreement that is one each of you can follow with relative ease and grace, rather than one imposed on you by a judge. If divorce is a reality in your life, do your homework so you don’t get caught up in what I call the “legal vortex.” My book Graceful Divorce Solutions: A Proactive and Comprehensive Guide to Saving You Time, Money, and Your Sanity is helping people to be informed and to be proactive for themselves so they don’t spend all of their assets on lawyers and their divorce. It takes effort to do this at a very challenging time emotionally, but you can do it. It’s well worth the effort. One of Marcy Jones's favorite slogans that she uses more than a few times in her book is "Knowledge is Power." 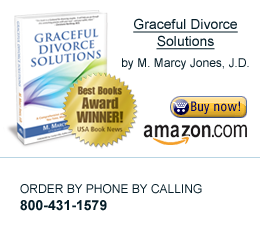 There is no doubt that "Graceful Divorce Solutions" is equal to several empowering consultations with a wise divorce coach, family counselor and one who knows the "ins and outs" of the current legal system. Jones gives divorcing couples, and those who care about creating a peaceful end to their marriage, practical support that they will not get anywhere else, certainly not for free.